Often our ancient traditions and practices are either debunked by the current generation or taken to with a lot of skepticism, this article seeks to clarify and explain through the lens of modern science the relevance of what has been gifted free to us by our enlightened ancestors. The morning of September 30, 2017 will witness the poornahuti of the seven-day long yagnam conducted in the Poorna Chandra auditorium in Prasanthi Nilayam as part of the Dasara celebrations. The hall would be overflowing with the devoted and so too would be the emotions of the thousands gathered to be touched by those sanctifying vibrations. For many, just being in that ambience and soaking in the sounds of those riveting mantras is quite an uplifting experience. Just like the joy of receiving a beautiful little toddler's innocent smile can never be expressed enough through literature or the fragrance of a jasmine described in words or the peace of being seated in front of the Samadhi in Prasanthi measured by any complex algorithms, the sublime and subtle yet potent feeling of being present in the vicinity of this Vedic sacrifice cannot be articulated to one's heart's content. How Can Burning Ghee Lead to World Peace? 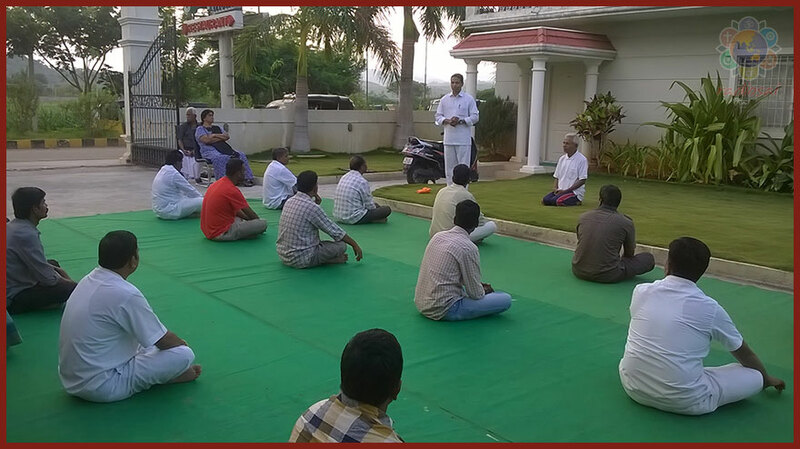 The purpose of this yagna, Bhagawan has said, is the welfare of all beings everywhere. How can lighting a fire and generously pouring ghee into it contribute to world peace? A so-called rationalist might ask. Imagine an isolated and illiterate tribal from the Amazon forest seeing a television for the first time in his life and someone tells him that in that man-made contraption he is actually watching something that is happening thousands of miles away. The aboriginal obviously would be shocked. In a sense, it is the same with the mantras. These have come to us from spiritual scientists who received insights about our physical world through metaphysics. While modern scientists spend billions of dollars in setting up complex laboratories to find answers to some of nature's mysteries, these scholars of yore spent billions of hours diving deep within into the complex phenomena that we are and thereby unravelled many a secret about nature. This worked because what is outside is only a reflection of what is inside and vice versa. For instance, physicists tell us how an atom is like a miniature solar system, with a tight nucleus playing the role of a Sun orbited by electrons like planets. But the nucleus is incredibly tiny compared to the orbits of the electrons. Sir Tom Stoppard, the famous British playwright, gave the best imagery. He said, if the nucleus is like the altar of St Paul's cathedral (which is the second largest church building in UK), an electron is like a moth in the cathedral, one moment at the altar, the next by the dome. Imagine, squeezing all the space out of an atom. Well, if we did that to all the atoms in all the people in the world, we could indeed fit the entire human race in the volume of a sugar cube! That is how 'hollow' everything around us is! Isn't that incredible? The macrocosm is indeed in the microcosm. The ancient seers knew that if you are untangled one, you could understand the other too. That is how they demystified a lot of phenomena we see around us and packed this knowledge in the form of mantras so that several future generations could benefit from the wisdom. They did it selflessly; no one paid them for it nor did they expect anything from anyone. Unlike most scientists of today, they had no agenda other than guiding their fellow brethren towards a richer and fuller life. Those who are ignorant of all this either because they are dim-witted or foolishly disinterested, like the aboriginal with a modern gadget, abhor these chants and practices as gibberish or eccentric. They feel 'oh, this is all mumbo-jumbo going on from centuries with no scientific basis and we as “progressive men” should desist from endorsing these old-fashioned conventions'. “Is it unbelievable that Krishna was able to appear in the homes of gopikas simultaneously? If in today’s times, a yantra (a machine like TV) is able to achieve such a result, how much more power should be attributed to mantra? 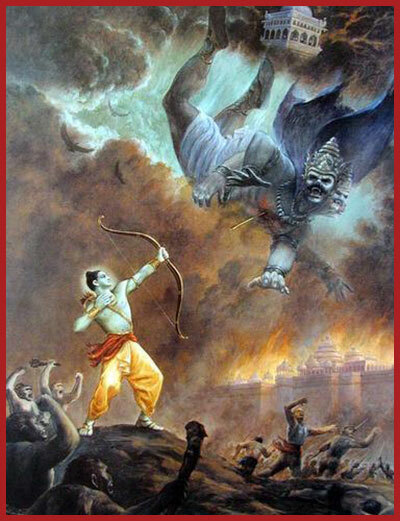 In fact, if we compare the military arsenal of today with those mentioned in the scriptures be it Ramayana or Mahabharata, there were astras (weapons) which could bring down rain, could throw the target thousands of miles away or remove the ground from the feet of the opponent or instantly create a disastrous conflagration to burn the enemy into ashes. All this was achieved not by creating massive and expensive weapon factories like in the modern era, but by investing a simple arrow with the power of a potent mantra. It sounds incredulous to us because we cannot comprehend just how an Amazonian native would be clueless about a smart phone. At the same time, like some tribal who wouldn't dismiss the television as a ghostly object but believe in its output and as a result experience the wonder it offers, fortunately there are many today who do believe in these ancient practices. And, thanks to that faith, they are blessed to witness miracles. In 1984, Bhopal, the capital of the state of Madhya Pradesh, experienced the world's worst chemical disaster. Known as the Bhopal Gas Tragedy, it occurred due to the accidental leakage of nearly 42 tons of methyl isocyanate (MIC), a toxic gas from a pesticide factory in the intervening night of December 2-3. Thousands died and over 550,000 suffered partial or permanent disabilities. Almost 33 years after this massive man-made mishap, even till this day the trauma and ill-effects of the chemical poisoning continues. The rate of cancer among the gas victims is ten times higher compared to the unaffected population, and every now and then there are untimely deaths. Even though the danger was so grave, a few families escaped the horrible adverse impact of the exposure to lethal radioactive elements released into air and water; it was as if a protective shield safeguarded them. Unknowingly they had built this security cover around them because of performing Agnihotra Homa, a Vedic sacrifice. Mr S L Kushwaha (45) woke up at half past one in the night of Dec 3 on hearing his wife Triveni vomiting. Soon he too began coughing and felt pain in his chest. His eyes started burning and he felt suffocated. His children got up in a few minutes and complained of the same symptoms. He had no clue what was happening. When he looked out of the window he saw people fleeing in panic. 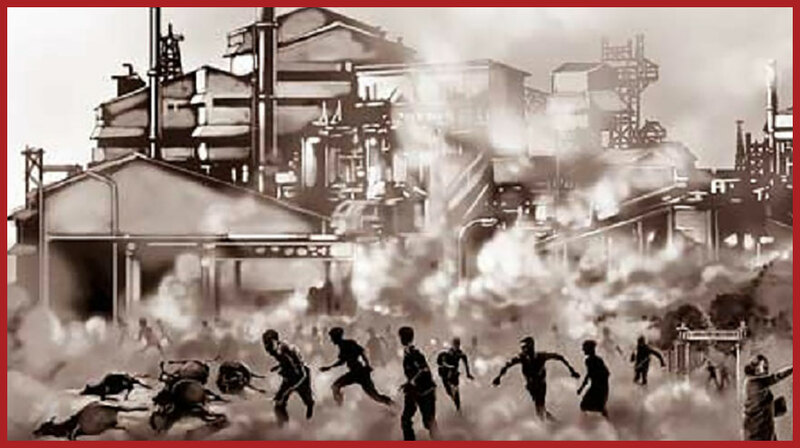 Someone shouted to inform that there was poison in the air because of a gas leak in the Union Carbide factory that was a mile away. Kushwaha too decided to run. But his wife stopped him and said, “Why not do Agnihotra?” Somehow Kushwaha agreed and they did. In 20 minutes, all the terrible symptoms disappeared. Agnihotra is a Vedic sacrifice based on the Vedic sciences of bioenergy, medicine, agriculture and climate engineering. In this, a fire is prepared in a copper pyramid tuned to the biorhythm of sunrise/sunset and into this is offered ghee, cow dung, rice and other ingredients accompanied with Vedic chants. It was found that the smoke that is generated gathers particles of harmful radiation in the atmosphere and on a subtle level neutralizes their radioactive effect. Nothing is destroyed, it is only transformed from the negative to the positive. Mr M L Rathore (33) with his mother, wife and four children lived near the Bhopal Railway Station where dozens died of MIC poisoning. He had been doing Agnihotra for five years. 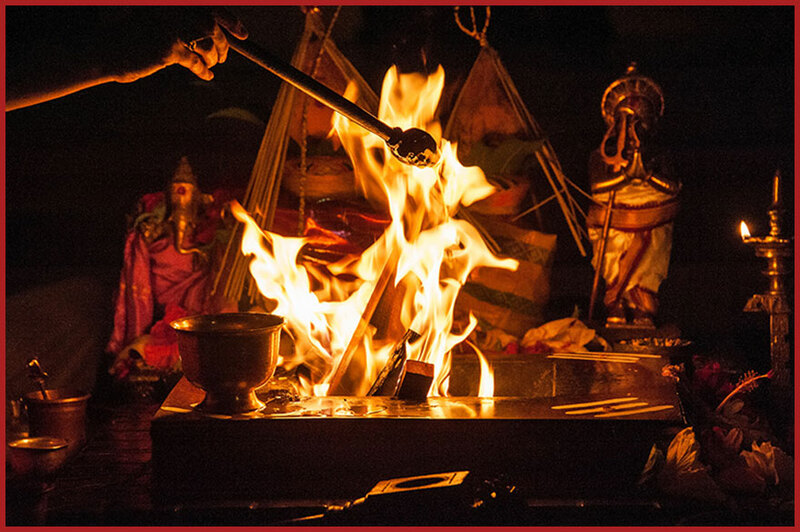 When the calamity struck, he immediately started the sacrifice and continued it with another ritual “Tryambakam Homa”. The lethal gas did no damage to his family. Another example that stands out is the outstanding case of the Prajapati family. While Mr O N Prajapati suffered severe irritation and redness of eyes, his wife was in critical condition. So were his two sons. He instantly started performing the Agnihotra Homa and within a week was free of all the symptoms of the deadly attack. His wife too was healed but took longer to recover. One of his sons, aged 13, contracted tuberculosis. Prajapati did not give him the conventional medicines but preferred Agnihotra treatment. In a few weeks, he was cured of the infection by the positive effects of the Agnihotra atmosphere, as well as the Mahamrityunjaya Homa and regular use of Agnihotra ash as medicine. Here is the most interesting fact – Prajapati's youngest daughter, who was born one year after the tragedy, is in fact the healthiest of all his children. This was reported in one of India's national newspapers on April 7, 1985 carrying the title “Vedic Way to Beat Pollution'. What is the secret? How did this 'miracle' happen? One explanation offered by Mr Miroslav Haber, a physicist from former Yugoslavia, is that we can prevent our body from absorbing radioactive elements by giving each of these elements to the body in a natural (non-radioactive) form. Once the body is saturated with these elements, it rejects any radioactive versions of the same. Even if they are absorbed before, they eventually get replaced with the non-radioactive elements. Now where do we get these non-radioactive elements to protect our body? The answer is Agnihotra ash. It contains all the 92 natural chemical elements with their natural radioactivity. The most fantastic thing is even if the homa is done with radioactive ingredients, the ash is always non-radioactive! A similarly stunning revelation was arrived at by a team of scientists led by Prof. V P N Nampoori, former director of the International School of Photonics, Cochin University of Science and Technology. The team did a detailed study of the effects of a 4000-year old fire ritual conducted in Panjal, a remote village in Thrissur district of the state of Kerala. 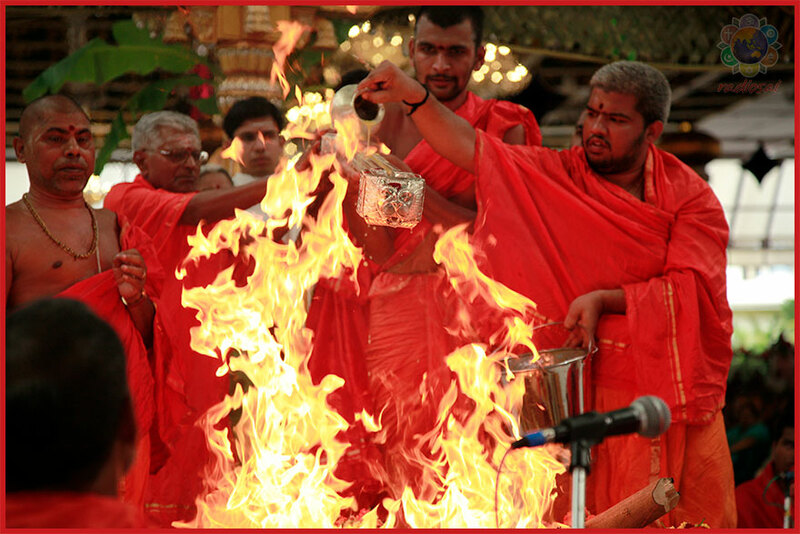 This yagnam called “Athirathram” was held on April 4-15, 2011. According to the scientists, the fire ritual seems to have accelerated the process of seed germination. Also, the microbial presence in air, water and soil in and around the region of the fire ritual was vastly diminished. The team had planted three types of seeds – cowpea, green gram and bengal gram – on all four sides of the ritual venue at varying distances. They found that the growth was better in case of pots kept closer to the fire altar. The effect was more pronounced in the case of bengal gram which grew at 2,000 times faster than in any other place. The study focused on counting bacterial colonies at three locations – within the fire altar, 500 metres away and 1.5 kilometres away. 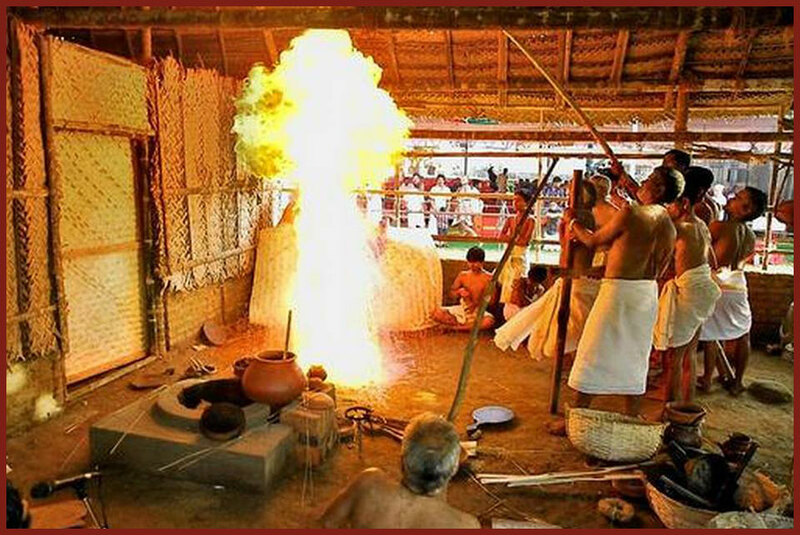 The microbial analysis made before, during and four days after the yagna revealed that the air in the vicinity of the altar was pure and had very low count of microbe colonies. This was true not only of the air but also of the water and soil around the ritual venue. What is most astonishing is when this research team conducted tests near the fire altars of 1918 and 1956 Athirathram, which fortunately are still preserved in the backyards of Namboothiri homes, they found that those bricks continued to be microbial free. “It is an indication that the effect of the ritual is long-lasting,” said the researchers. Studies are in fact looking to find if other positive changes on the atmosphere are similarly enduring. Mr G R Praveena, a Sanskrit scholar, who apart from teaching bioscience has also been inspiring students of Sri Sathya Sai Higher Secondary School, Prasanthi Nilayam, to take to Vedic chanting and learning, says, “All the Vedic hymns have multiple deeper meanings than what is generally understood. The English translations of these mantras are grossly inadequate and incomplete. “For example, if we take the popular hymn Sri Rudram which is chanted daily in Prasanthi Nilayam, the first part of it called “Namakam” may superficially refer to offering prostrations to the Vedic deity Rudra and seeking His protection from the forces of nature. But at the same time this entire hymn is also about the medicinal system. “I am now nearing 50, if I am this active today, it is because of the strength and vitality derived from chanting these mantras,” Mr Praveena replied and continued, “When I go to the ground, boys who are one-third my age, want to play with me because they find it challenging and are often wonder stuck with my agility.